This gorgeous sparkling red liqueur looks spectacular in a clear bottle; perfect for a host or hostess gift. Make this at least three to four weeks ahead. Use a recycled wine bottle, or purchase a decorative one. New corks and paraffin can be found at the hardware store. 1. Place sugar and water in a medium sized saucepan and stir to wet. Bring to a boil over medium heat. Stir in cranberries, turn down heat to low and simmer for 1 minute. Remove from heat and cool to room temperature. 2. Pour into glass container and add vodka; stir to combine. Store in a cool, dark location for 3 to 4 weeks. Stir the contents twice a week. 3. Strain out the berries collecting the liqueur in a bowl. Press down on the berries to extract as much liquid as possible. Discard the berries. Strain the liqueur again through cheesecloth or through a very fine strainer into a 4-cup measuring cup. Repeat, if necessary, until clear. 4. 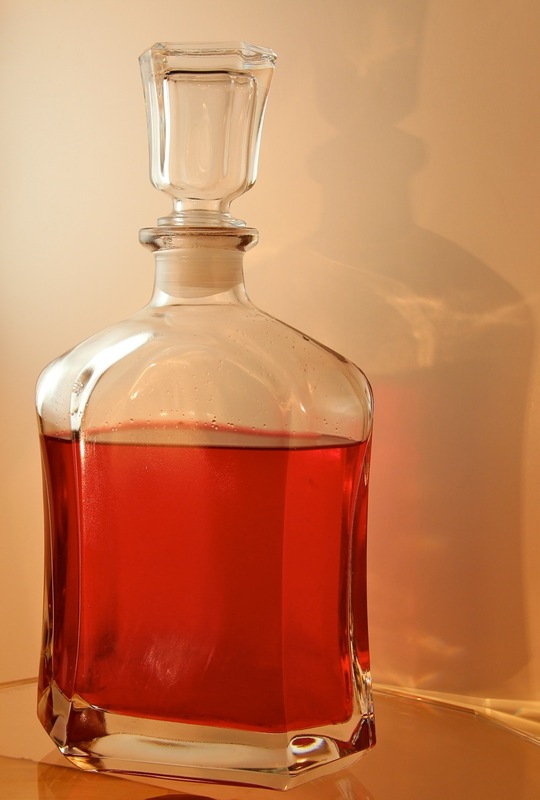 Using a funnel, pour liqueur into clean glass bottle leaving 2-inch space at top. Any extra can be reserved for you, the deserving cook. Thread 10 cranberries onto skewer and slip into bottle; cut down the skewer to fit, if necessary. Insert cork. Liqueur is ready to serve, or may be stored for up to 3 months. 1. Place paraffin and crayon in tin can and place can in small saucepan with enough water to come one quarter up the sides of the can. Heat over medium heat until paraffin and crayon melt, stirring occasionally with a metal spoon. Turn off heat. 2. Invert corked bottle and dip into wax to cover cork and down the bottle neck about 1-inch. Remove from wax and cool for a minute, then dip again. Repeat until the wax is opaque and you can no longer see the cork. Cool completely. 3. Wipe bottle dry and affix label printed with name of contents.